Photo by flickr user <a href="http://www.flickr.com/photos/funky64/3596095552/">funky64</a> used under a <a href="http://www.creativecommons.org">Creative Commons</a> license. California’s prisons are so overcrowded that the state is violating inmates’ constitutional rights, three federal judges ruled today in a decision imposing a cap on the prison population that will force the state to release nearly 43,000 prisoners over the next two years. The 185-page opinion also accused the state of fostering “criminogenic” conditions, compelling former prisoners to commit more crimes and feed a cycle of recidivism. 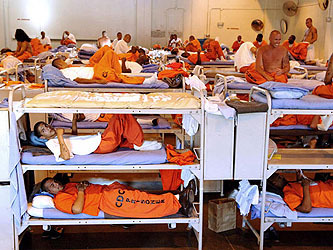 ….Even as Schwarzenegger has promised reform, the corrections budget has exploded during his term, from $4.7 billion in fiscal 2004 to nearly $10 billion in fiscal 2007, or about $49,000 for each adult inmate. So will the judges be able to make a dent in all this? Hard to say. Every attempt to date has failed, and the LA Times quotes a spokesman from the California Attorney General’s office saying, “This order doesn’t release anybody from prison, it just orders the state to come up with a plan. 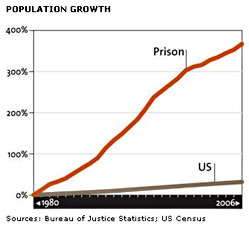 It wouldn’t be hard to shrink prison populations drastically while reducing crime, by doing a better job of supervising prison releasees on parole using drug-testing and position monitoring with swift and certain, but mild, sanctions for each violation of the rules….That’s the big finding from Project HOPE in Hawaii. So far, though, there’s no indication that the Governor or the Department of Corrections and Rehabilitation are thinking along those lines. Instead they’ll fight the case all the way up to the Supreme Court, and then blame the judges when their failure to do their jobs leads to a crime increase.